The importance of yarn weight is no light matter in knitting and crochet! The weight of the yarn, referring to the yarn thickness really, is critical to many elements of your knit or crochet project. Thinner (lighter) weight yarn is ideal for delicate, lacy or intricate detail and will require smaller hook and needle sizes. However the cost to work thin and light for detail is time to complete. All things being equal, say the project is a baby blanket, lighter weight (thinner) yarn will require more time to finish than a heavier weight (thicker) yarn, which will work up quicker using larger hook and needle sizes. All good patterns will have a specific yarn weight called out and a “gauge” specified for that weight (stitches per inch) you should be producing to achieve the size, look and feel of the project design. If you choose not to follow the yarn weight advice, or to ignore gauge requirements, your project will be a different size than designed. Not only that but it may look completely different from photos the design promises. For example, imagine a light and intricate baby afghan with a lacy border designed for a DK (#3) weight yarn, and you use a Super Chunky (#6) yarn instead. The blanket will turn out much larger and all the delicate detail will be lost, essentially a different blanket. 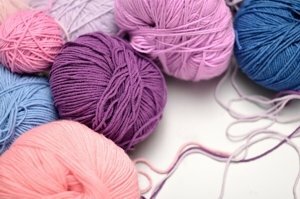 Let’s talk about the yarn weight names and classifications. The United States and the United Kingdom have different names for the same weights and you will see both as we import / export yarn between our two regions (not to mention the accessibility due to the Internet). Cali Chic Baby has a handy “yarn weight conversion guide” to help you compare the weight names against the classification #s to know what you are buying. The different names are not difficult, but remembering them (or having a handy guide) will make yarn shopping and substitution more delightful and low stress!